Provide comfort for the family of Sandra Banks with a meaningful gesture of sympathy. Rollins' Mortuary announces with deepest sympathy the passing of Ms. Sandra Renita Banks age 53, of Tuscaloosa, on Sunday, January 13, 2019, at DCH Regional Medical Center. Funeral services were held Saturday, January 19, 2019, at 3pm at Beulah Baptist Church,. Rev. David Gay, Jr. officiated. Burial followed in Cedar Oak Memorial Park with Rollins' Mortuary directing. 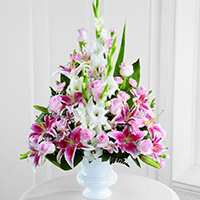 To send flowers in memory of Sandra Renita Banks, please visit our Heartfelt Sympathies Store. Jason Lipscomb & Lou Campos and Georgia and gillette have sent flowers to the family of Sandra Renita Banks. Jason Lipscomb & Lou Campos purchased the The FTD Precious Peace Arrangement for the family of Sandra Banks. To my beloved sister, I will miss our trips, talks, and laughter. I know you are not far away because you always tried to watch after your Lil sister, as you would say. Fly high my angel, you will truly be missed!! Memories of laughter always!!! love you. My deepest condolences the family and friends.